December 12, 2017: SEDI Executive Committee Luncheon Meeting as section Secretary. December 10-15, 2017: Off to New Orleans for Fall AGU Meeting! Come learn about SiC in exotic planets from graduate student Kierstin Daviau; limited exsolution of MgO from the core from former student Zhixue Du; melting phase relations of ferropericlase at the CMB by graduate student Jie Deng; Fe-Si-O immiscibility in the core by graduate student Sarah Arveson; and PI Kanani Lee will be giving an invited talk on how redox state affect mantle properties. November 17-19: Doing science! APS beamtime at HPCAT! August 30, 2017: First day of classes for the Fall 2017 semester. August 21, 2017: Solar Eclipse! August 13 - 18, 2017: Goldschmidt Conference in Paris! 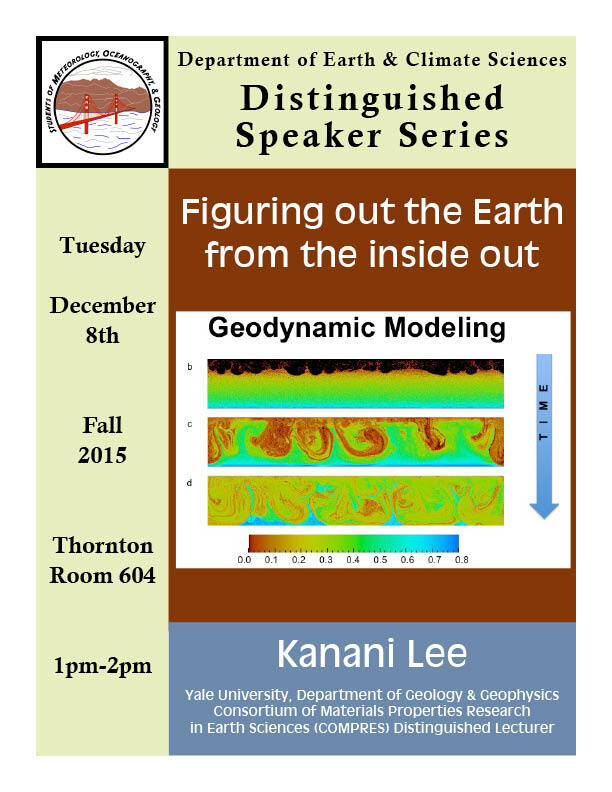 Kanani to give an invited talk on how redox affects mantle convection and possibly atmosphere composition. August 7, 2017: Welcome to Bruce Zhou, a visiting researcher who recently graduated from University of Illinois Urbana-Champaign with a Bachelors in Physics. Bruce will spend the next ~1 year learning how to do melting in a LHDAC. Watch out world! August 2, 2017: AGU abstracts due. Five abstracts submitted from our group! Looking forward to December in New Orleans. June 26, 2017: Jury Duty! May 22, 2017: Yale University Commencement. Congratulations Class of 2017! May 8-9, 2017: More laser heating with Rebecca Fischer! April 28, 2017: Congratulations to Sarah Arveson and Kierstin Daviau on being award a CT Space Grant! April 27, 2017: Jie Deng’s 3rd Year Review. Well done! April 26, 2017: Neala Creasy’s 3rd Year Review. Well done! April 19, 2017: Congratulations to Sarah Arveson for successfully passing her qualifying exam! April 18, 2017: New paper by Kierstin Daviau on the high-pressure phase transition in SiC published today in Physical Review B! April 13, 2017: Kierstin Daviau’s 4th Year Review. Well done! April 7, 2017: University of Conneticut Physics Colloquium on Planetary Diversity. March 30, 2017: CRLT Players Diversity & Education presentation. March 21-23: Beamtime at HPCAT-IDB. March 11-26, 2017: Spring Break! February 25, 2017: G&G Retreat. Big ideas and exciting prospects! February 22, 2017: Sell back my TDI Sportwagen to VW…dirty emissions :(. Now we are a 1-car family! February 3-4, 2017: G&G Graduate Student Open House. Looking forward to meeting the prospecitve students. January 21, 2017: Women’s March in Hartford, CT.
January 19-20, 2017: More laser heating with Rebecca Fischer! January 9, 2017: New paper by Jie Deng on temperature correction for wavelength-dependent absoprtion published today in the Journal of Applied Physics. January 1, 2017: Happy New Year! December 11, 2016: Off to San Francisco for the Fall AGU Meeting! December 9, 2016: NSF Geophysics proposals DUE. December 1-2, 2016: Rebecca Fischer visit to laser-heat. How will these partitioning experiments behave? November 17-19, 2016: Beamtime at HPCAT-IDB. October 12, 2016: Traveling to Brookhaven National Lab’s NSLS II for some IR/VIS time. August 31, 2016: First day of classes for Fall semester 2016. Welcome back students! August 4, 2016: Happy 5th Birthday to my son Makana! August 1, 2016: New paper from our group by former postdoc Tingting Gu published in Nature Geoscience! Read the press release here. July 3, 2016: Happy 1st Birthday to my son Keola! May 30, 2016: New paper from our group by former postdoc Konstantin Glazyrin published in JGR, Solid Earth on how undesirable stress affects the spin transition in ferropericlase (Mg,Fe)O! May 23, 2016: Yale Commencement. Congratulations to Zhixue Du (PhD, Geology & Geophysics) and Vasilije Dubrosavljevic (BS, Physics (Intensive)). April 20 - 22, 2016: APS HP-CAT IDB beamtime. April 18, 2016: Neala Creasy’s qualifying exam. She passes! Congratulations! April 11, 2016: Kierstin Daviau’s third year review. April 7, 2016: Jie Deng’s qualifying exam. He passes! Congratulations! March 12 - 27, 2016: Spring Break! January 19, 2016: First day of classes, Spring 2016. January 1, 2016: Happy New Year! December 14 - 18, 2015: Fall AGU Meeting in San Francisco. Graduate students Kierstin Daviau, Jie Deng, Sarah Arveson and Neala Creasy all have posters. Kanani has a talk and poster. November 30, 2015: Second issue of Adventures of Geo! to the printer to be ready for Fall AGU Meeting. September 28, 2015: NSF CSEDI proposals DUE. September 2, 2015: Start of the Fall 2015 semester. August 31, 2015: Freshmen advising at Pierson College, Yale. August 24-25, 2015: COMPRES site visit to NSLS-II. August 5, 2015: AGU Fall Meeting abstracts are due. Kanani, Kierstin and Jie all submit abstracts. August 2015: Farewell to Yusu Liu and Zhixue Du as they embark on their next adventures! Yusu off to MIT for graduate school and Zhixue off to the Geophysical Lab as a Carnegie postdoctoral fellow. July 10, 2015: NSF Petrology & Geochemistry proposals DUE. July 3, 2015: Welcome to Keola Maluhia Henson Wallenta:). 9 pounds, 7 ounces and 21.5 inches long healthy baby boy! July 2, 2015: Final NSF budgets due for new proposals to grants administrator. June 21, 2015: Happy Father’s Day! If you are able to, be sure to give your dad a great big hug and kiss and thank him for all he has done and continues to do for you. June 6-16, 2015: Kierstin Daviau is off to the Big Island of Hawaii for observations at Mauna Kea. May 18, 2015: Yale Commencement. Congratulations to Yusu Liu, class of 2015. Best of luck as you head to MIT for graduate school. May 14, 2015: COMPRES Distinguished Lecture Series announces Kanani as one of the lecturers for 2015-2016 academic year. Get your requests in by July 1, 2015. May 11-12, 2015: New Haven Science Fair! May 11, 2015: Welcome to undergraduate Vasilije Dobrosavljevic (senior project) and graduate student Neala Creasy (minor project) to our group! May 10, 2015: Happy Mother’s Day! If you are able to, be sure to give your mom a great big hug and kiss and thank her for all she has done and continues to do for you. May 3-6, 2015: Kanani’s off to Caltech for the Comparative Tectonics Workshop! April 8, 2015: Former Bateman Postdoctoral Fellow Lowell Miyagi (U. Utah) back in town for a short visit and seminar. Welcome back! April 2015: Welcome to graduate student Jie Deng (major project)! March 13, 2015: UCL department seminar by Kanani Lee on mantle redox. March 8-14, 2015: Kanani Lee off to UCL! February 24, 2015: Successful PhD defense by Zhixue Du! Also, soon to be a Carnegie Postdoctoral Fellow. Congratulations! February 6-7, 2015: G&G graduate student open house. Exciting to meet bright and interesting prospective students. January 1, 2015: Happy New Year! Welcome to our new lab manager Jennifer Girard. December 1, 2014: We bid farewell to our longtime lab manager George Amulele! Best of luck in Australia. November 11-15, 2014: More XRD beamtime at HPCAT! October 19-27 2014: Kanani Lee to UCL for collaboration. August 27 2014: First day of the Fall 2014 semester. August 6 2014: AGU Fall Meeting Abstracts are due. The Lee group submits 6 abstracts! August 5 2014: Playing with P in the lab?!? July 26 2014: Yale G&G department pool party! July 21-23 2014: Kanani Lee gives an invited talk at the Z-User Meeting in Albuquerque, New Mexico. July 7-21 2014: Kanani Lee as Mineral Physics Lecturer at the CIDER Summer Program at UC Santa Barbara’s Kavli Institute for Theoretical Physics. June 21-27 2014: Graduate Student Zhixue Du attends the Gordon Research Seminar and Conference for Research at High Pressure. June 16-19 2014: Kanani Lee and graduate students Zhixue Du and Kierstin Daviau attend the Annual COMPRES Meeting at the Skamania Lodge in Stevenson, WA. June 8 2014: Lee Lab Group Summer Party! May 7 2014: Congratulations to undergrads Yusu Liu and Marjorie Hirs, recipients of the Von Damm award. April 18 2014: Welcome to undergraduate G&G major Marjorie Hirs as she joins our group! March 17 2014: Our group members become first-time users at CFN at Brookhaven National Laboratory to use the Focused Ion Beam (FIB). February 27 2014: Welcome to undergraduate Chemistry major Yusu Liu as she joins our group! February 25 2014: Group dinner for farewell to postdoc Tingting Gu and to celebrate Kanani’s promotion. February 24 2014: Happy News: Kanani Lee passed her promotion! Assistant Professor –> Associate Professor (without tenure). January 1 2014: Happy New Year! December 9-13 2013: AGU Fall Meeting. Graduate student Zhixue Du and former postdoc Konstantin Glazyrin present posters on melting ferropericlase and the effects of non-hydrostatic stresses and spin transition of Fe in ferropericlase, respecitvely. Kanani Lee gives talk on iron melting. October 30-November 1 2013: XRD beamtime at HPCAT (APS)! October 27-29 2013: GSA Meeting in Denver. Kanani Lee presents first measurements on iron melting at high pressures. October 16 2013: XRD beamtime at the GSECARS (APS)! October 4 2013: Former undergraduate Ilya Uts and former postdoc Konstantin Glazyrin’s newest paper published in RSI on pressure gradients in the laser-heated DAC. See the publications page for a pdf. September 13 2013: Congratualtions to former postdoc Konstantin Glazyrin and their new baby boy Leonid! September 3 2013: Welcome to our group’s newest member, postdoc Dr. Tingting Gu! August 17 2013: Congratulations to lab manager George Amulele & Kirindi on their marriage! All the best to the couple. August 16 2013: New student Kierstin Daviau successfully loads her first sample! She’s a quick learner with only 8 days since she touched her first DAC! August 6/7 2013: Abstracts for GSA and AGU are submitted! Denver and San Francisco, here we come! August 5 2013: Welcome to our group’s newest graduate student Kierstin Daviau! August 4 2013: Graduate student Zhixue Du rode the 100-mile “Tour of Litchfield Hills”! Makana turns 2! July 19 2013: Zhixue’s new paper published in RSI on 4-color temperature mapping. Check publications page for a pdf. July 10 2013: 24-hour beamtime at GSECARS 13-IDD. June 27 2013: Graduate student Zhixue Du off to SSAA Symposium in Albuquerque, NM to discuss 4-color temperature measurements and melting. June 19 2013: Kanani leads jobs panel for students and postdocs at COMPRES Meeting. June 17 2013: Off to the COMPRES Meeting in Wisconsin! May 31 2013: New photo of Kanani uploaded. Although the photo is still ~6 months old, at least it isn’t nearly 10 years old. May 28 2013: Labview is working. We can now synch our laser, cameras, spectrometer and photodiodes! May 24 2013: Received new National Instruments equipment and Labview. Time to start shaping our laser pulses, triggering our detectors and the like! Fun things in store in the world of laser heating and melting. Undergraduate Ilya Uts’s graduation and new job! Postdoc Kaveh Pahlevan’s new adventure to Boudler then to Nice. Graduate student Zhixue Du has been awarded the Ford Prize. The Ford Prize is given for excellence in “mineralogical” studies. Postdoc Nikku Madhusudhan’s acceptance of a faculty position at Cambridge! May 20 2013: Yale Commencement. Congratulations to Ilya Uts on his graduation from Yale! Best of luck out there in the real world. May 20 2013: First entry on the “News” section. Updated woefully out-of-date webpage including uploaded new published papers.